Low back pain (LBP) and sciatica place significant burden on individuals and healthcare systems, with societal costs alone likely to be in excess of £15 billion. Two recent systematic reviews for LBP and sciatica identified a shortage of modelling studies in both conditions. The aim of this systematic review was to document existing model-based economic evaluations for the treatment and management of both conditions; critically appraise current modelling techniques, analytical methods, data inputs, and structure, using narrative synthesis; and identify unresolved methodological problems and gaps in the literature. A systematic literature review was conducted whereby 6512 records were extracted from 11 databases, with no date limits imposed. Studies were abstracted according to a predesigned protocol, whereby they must be economic evaluations that employed an economic decision model and considered any management approach for LBP and sciatica. Study abstraction was initially performed by one reviewer who removed duplicates and screened titles to remove irrelevant studies. Overall, 133 potential studies for inclusion were then screened independently by other reviewers. Consensus was reached between reviewers regarding final inclusion. Twenty-one publications of 20 unique models were included in the review, five of which were modelling studies in LBP and 16 in sciatica. Results revealed a poor standard of modelling in both conditions, particularly regarding modelling techniques, analytical methods, and data quality. Specific issues relate to inappropriate representation of both conditions in terms of health states, insufficient time horizons, and use of inappropriate utility values. 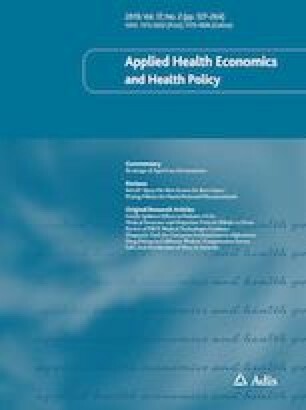 High-quality modelling studies, which reflect modelling best practice, as well as contemporary clinical understandings of both conditions, are required to enhance the economic evidence for treatments for both conditions. The online version of this article ( https://doi.org/10.1007/s40258-019-00471-w) contains supplementary material, which is available to authorized users. Nadia Corp, Research Associate: Systematic Reviews at Keele University, assisted with the development of the search strategy. JH, SJ, KK, RaO and ReO contributed to the study conception and design, design of the search strategies and article selection, and interpretation of data. JH conducted the search strategies and retrieved identified articles, performed data extraction, and drafted the manuscript. JH, SJ, KK, RaO, ML contributed to manuscript preparation. All authors approved the final version of the article. This research was undertaken as part of a PhD project, with a 3-year research stipend for JAH funded by the Institute for Primary Care and Health Sciences, Keele University. KK was supported through a Higher Education Funding Council for England (HEFCE) Senior Clinical Lecturer award. ML, RaO, ReO, and SJ have no conflicts of interest to declare. Parson S, Ingram M, Clarke-Cornwell AM, Symmons DPM. A Heavy Burden: The occurrence and impact of musculoskeletal conditions in the United Kingdom today. Arthritis Research UK Epidemiology Unit; 2011. http://www.escholar.manchester.ac.uk/uk-ac-man-scw:123774. Bridges S. Chronic pain. In: Craig R, Mindell J (eds). Health Survey for England—2011 health, social care and lifestyles. NHS Digital. https://files.digital.nhs.uk/publicationimport/pub09xxx/pub09300/hse2011-ch9-chronic-pain.pdf. Mahon R. Temporal uncertainty in cost-effectiveness decision models. PhD thesis. 2014. http://etheses.whiterose.ac.uk/8268/1/Ronan%20Mahon%20Thesis%20%28Feb%202015%29.pdf. Institute for Clinical and Economic Review. Management options for patients with low back disorders. 2011. https://icer-review.org/wp-content/uploads/2016/02/LBP-Final-Appraisal-6-24-11.pdf. Stromqvist B, Fritzell P, Hagg O, Jonsson B. National Swedish Register for Lumbar Spine Surgery report 2008. http://www.4s.nu/pdf/Ryggregisterrapport_2008_eng_version.pdf. NICE 2013. National Institute for Health and Care Excellence. Guide to the methods of technology appraisal 2013. https://www.nice.org.uk/process/pmg9/chapter/foreword. Korean National Health & Nutrition survey. 2007. https://knhanes.cdc.go.kr. Ministry of Employment and Labor. http://laborstat.molab.go.kr. Centers for Disease Control and Prevention. National Health Interview Survey. http://www.cdc.gov/nchs/nhis.htm. Ontario Case Costing Initiative. OCCI Costing Analysis Tool. 2010. http://www.occp.com. Accessed 24 Aug.
Centers for Medicare and Medicaid Services. MEDPAR Limited Data Set (LDS)—Hospital (National). http://cms.gov/Research-Statistics-Data-and-Systems/Files-for-Order/LimitedDataSets/MEDPARLDSHospitalNational.html. Accessed 29 Jan 2013. Stromqvist B, Fritzell P, Hagg O, Jonsson B. National Swedish Register for Lumbar Spine Surgery report 2008. http://www.4s.nu/pdf/Ryggregisterrapport_2008_eng_version.pdf. Accessed 15 Jul 2014.